Welcome to the June Stamp of the Month Australasian Blog Hop. This is a circular hop. If you arrived from Nell’s Blog, you are in the right place. Simply read through this post and click on the link to the next blog at the end of it. Keep reading and hopping until you find yourself back where you started from. Each blog will showcase a project featuring the Hello Foxy (S1706) stamp set which is June Stamp of the Month. The foxes and flowers are petite so you can fit a few on a card or page border. They all look great coloured with your favourite medium and the sentiments are fun. The first card today uses the linen print paper from the No Worries paper pack. You can stamp directly onto it and colour with watercolour pencils to get a soft look. To add the dots around the Oval Thin Cut simply place the thin cut back over the shape after you’ve stuck it down and draw dots around the outside edge. The next card uses the Wood Slats embossing folder. Once it is embossed, simply run the Desert Sands ink pad over the raised elements to create contrast. Move the inkpad in the direction of the lines with a light touch for best results. The frolicking foxes were hand cut. The wood panel paper is also from the No Worries paper pack. Hello Foxy (S1706) is only available during June, 2017. Full retail price is $27 but you can have this gorgeous set for just $7.50 when accompanied by a $75 order. Place your order with your Close To My Heart Consultant. Did you like these cards? 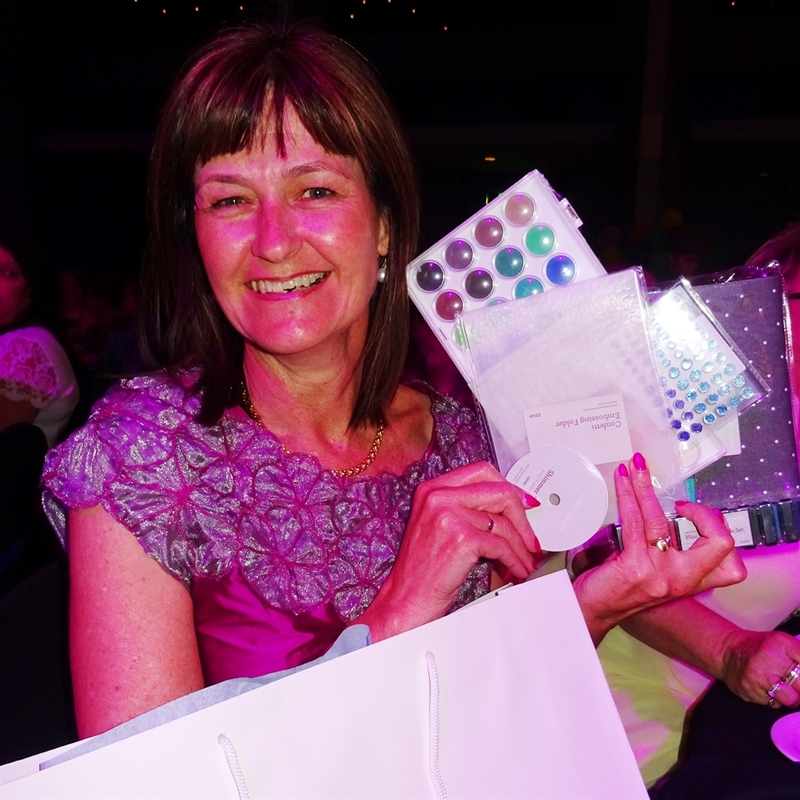 I’d love you to leave a comment for me before you click on the underlined link and move on to Maz’s Blog aMAZing Close To My Heart Creations , to see the gorgeous project she has designed for you. Welcome to the CTMH Australasian Dreamin’ Big Blog Hop. This is a circular hop. If you arrived from Nell’s Blog you are in the right place. Simply read through this post and click on the link to the next blog at the end of it. Keep reading and ‘hopping’ until you find yourself back where you started from. 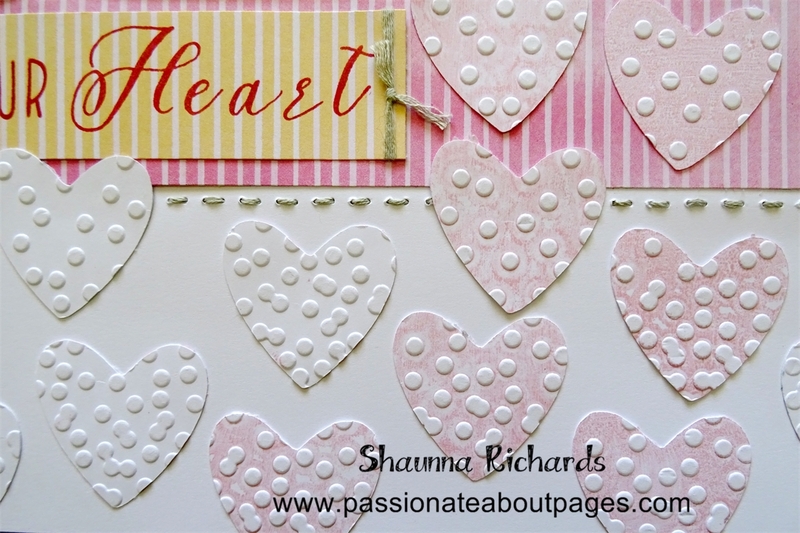 Each blog will showcase a project featuring the Dreamin’ Big Workshop Your Way (G1121) from Close To My Heart. The Dreamin’ Big collection is from the Seasonal Expressions Jan-Apr 2017 Catalogue. Once you begin creating with this collection you will never want to stop! The colours just seem to go with everything you have in your photos. This layout was created using leftovers after completing the Workshop Your Way layouts. Mounting the photos on Daisy White cardstock meant I only needed small pieces of the dotty paper above and below them. To create the golf ball you will need the Confetti Embossing Folder (Z3118), Whisper Ink (Z2872) and the Basic Circle Thin Cuts (Z3318). Dab the whisper ink pad over the raised dots inside the embossing folder BEFORE you place the paper in it. When you run it through your embossing machine the ink will transfer to the paper and look like the dimples on a golf ball. The Basic Circle Thin Cuts cut solid circles in a choice of 2 1/2″, 2″, 1 1/2″ or 1″. They are on special this month along with all our other Thin Cuts – 25% off! I had already used the Love Life sticker on another layout so I stuck the outline to scrap paper and cut around it. You can create the illusion of a long horizontal strip running behind you photos and papers by cutting a PML card into small pieces. 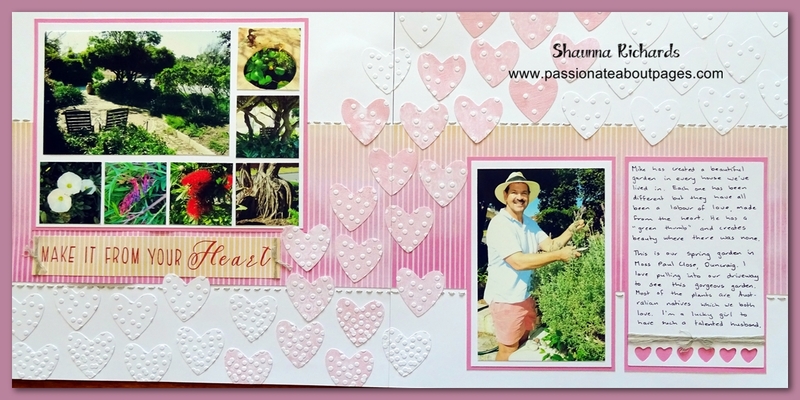 In this layout I used the juniper diagonal stripe PML. Zip strips with printed words make a nice accent for your layout too. The Dreamin Big Workshop Your Way (G1121) kit is only available until the end of April. Place your order with your Close To My Heart Consultant. If you don’t have a consultant, you can order online through my website . I’d love you to leave a comment for me before you click on the underlined link and move on to Doris’s Blog , Doris Taylor Creative Expressions to see the gorgeous project she has designed for you. We have friends who are as devoted to good food and wine as we are. Recently we had a Moroccan themed dinner party. Having never been to Morocco, I have no table accessories to suit. I needed my trusty CTMH supplies to create the illusion! I used Glitter paper and the Cricut Artiste Cartridge to make the placemats. They were perfect and everyone was very careful not to spill anything so I can use them again! The Ornate Blossoms Stamps (D1687) and Thin Cuts (Z3227) teamed nicely with my Shin Han markers to make napkin rings. I gold embossed the stamp before colouring. Six plain water glasses were transformed into a candle centrepiece with the aid of gold glitter wraps cut on the Cricut. One final decorative touch were the glass keepers made from Ornate Blossoms Stamps and Thin Cuts. The decorations didn’t take long to create but they certainly helped set the mood for a fun filled night of feasting. The photos below show some of the yummies we enjoyed. 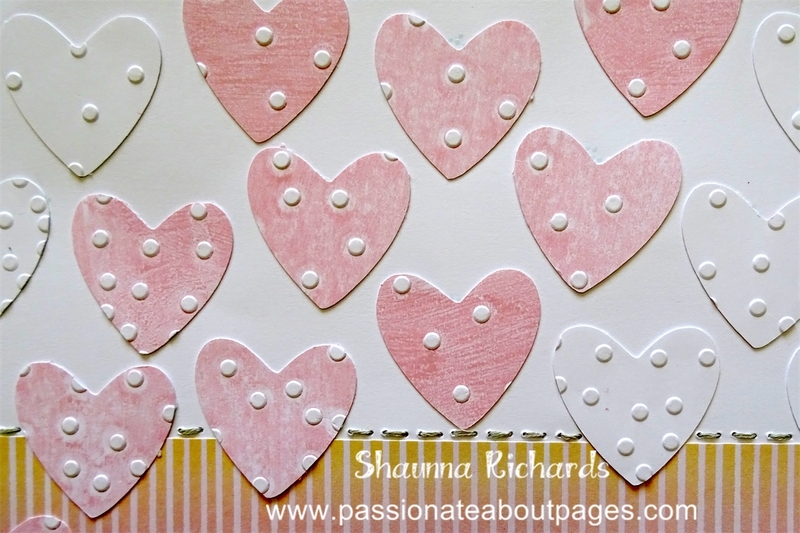 Creating texture with embossing folders is so easy! It transforms plain cardstock into something wonderful. In this layout I started with 3 plain cardstock colours (Whisper, Bamboo & Lagoon) and one Paper Fundamentals (Bamboo) sheet. 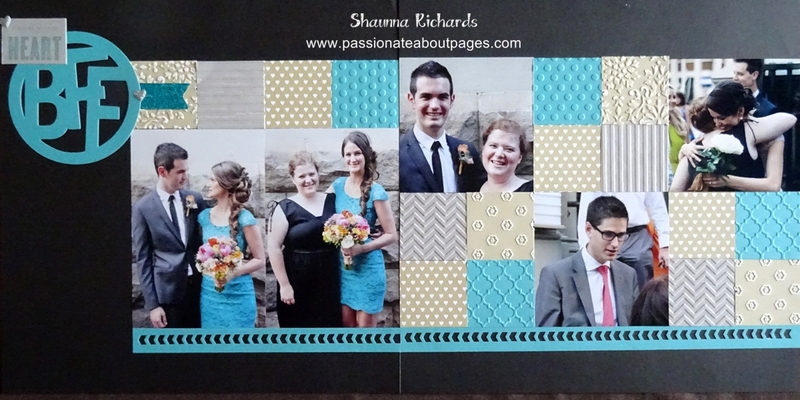 I cut 4, 2″ squares from each piece and used a variety of embossing folders on the plain cardstock. The Chevron Border Punch created a line to hold it all together and I kept the embellishments simple in the top left corner of the page. My journaling will go under the BFF Cricut cut. What photos and colours will you use to duplicate this pages? Check out the range of CTMH embossing folders here and our Fundamentals Paper range here. Remember every 5th online order this month receives a gift! I’ll email the winners at the end of the month.